Capitalism has always lived in and with crisis. Wars, revolutions, economic depression and repeated recessions, the threat of nuclear annihilation and ecological disaster have all failed to break the dominance of this economic and political system. 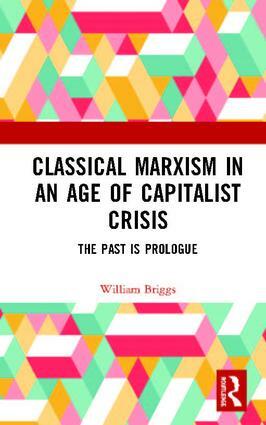 Challenging the predominance of capitalism in a world fraught with inequalities, this book returns to classical Marxism to reaffirm its relevance. It explores the contradictions within capitalism as well as explaining why Marxism has been unable to mount a sustained challenge to capitalism. In order to explore concrete alternatives in a period of increasing capitalist globalisation and crisis, it goes on to present perspectives by which theory and practice might be reunited to building independent political and organisational structures. A search for “something better”, this volume will be an engaging read for scholars and researchers of politics, especially political theory and political economy, economics, and sociology. William Briggs is an academic affiliated to the School of Humanities, Social Sciences, Arts and Education at Deakin University, Australia.